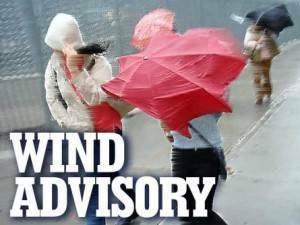 GALION — The National Weather Service in Cleveland has issued a wind advisory, which is in effect until 10 a.m. Friday, for Crawford County. Winds from the west at 25 to 30 mph, with gusts up to 50 mph, are possible. The wind will arrive early this evening and continue into Friday morning. The flood watch for this area remains in effect until 4 a.m. Friday. A strong cold front will move through the area this evening. Winds will turn west and become strong and gusty as the front passes. Some winds may be strong enough to blow down limbs, trees, and power lines. Scattered power outages are expected. A Wind Advisory is issued for sustained winds of 31 to 39 mph or gusts between 46 and 57 mph. Winds of this magnitude can cause minor property damage without extra precautions. Motorists should use caution especially motorists in high profile vehicles.